THE table is set for the second Woking Food & Drink Festival, from Friday to Sunday, September 5 to 7, which will be bursting with mouth-watering stalls and free activities for all of the family. Last year’s festival attracted in excess of 20,000 visitors. This year’s will be bigger and better with the festival’s footprint stretching across the pedestrian areas in Jubilee Square, Market Walk, Commercial Way, Mercia Walk, Gloucester Walk and culminating in a Fairtrade Food and Family Quarter at The Lightbox and WWF-UK’s Living Planet Centre. BIGGER THE ‘BATTER’ – the second instalment of the Woking Food & Drink Festival promises to build on the exceptionally well received inaugural event held in the summer of 2013, so don’t miss it! Festival highlights include: an assortment of more than 60 high quality food and drink stalls; live culinary demos from prestigious TV and local chefs in the Tante Marie Culinary Academy Theatre; barbeque demonstrations; a Fairtrade Food and Family Quarter; hands-on cookery workshops for children; a Bake Off competition judged by Great British Bake Off 2013 winner, Frances Quinn. It will all be topped-off by a healthy portion of live entertainment. Portfolio Holder for Promoting the Local Economy, Councillor Gary Elson, said: “Woking is fast becoming an alternative foodies destination with the second Food & Drink Festival, the opening of Market Walk and the announcements about new restaurants locating to the town. 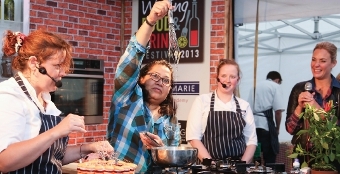 Whether you are a cookery beginner, improver or foodie fanatic, visitors to the Tante Marie Culinary Academy Theatre will be able to watch the cream of the crop deliver live gourmet demonstrations in the purpose-built, professional cookery marquee. Topping the bill will be demonstrations by Great British Bake Off 2013 winner Frances Quinn; Executive Chef for Stein Restaurants in Padstow and son of TV great Rick Stein, Jack Stein; best-selling author of cook-book Persiana, Sabrina Ghayour; locally trained Great British Menu 2014 contestant Neil Rankin; and former Head Chef at Hugh Fearnley-Whittingstall’s River Cottage, Mark Lloyd. Ben Piette – MasterChef 2010 semi-finalist and owner of London House restaurant in Old Woking. Thierry de Magneval – Former Sommelier and restaurateur at the Berkeley Hotel, Roux Brassiere, Roux at Parliament Square, La Gavroche and Chief Sommelier and owner of Cellar Magneval in Woking. Curry Chef of the Year 2014 – The winner will be announced at the end of August. Speaking about her appearance, Frances said: “I’m really looking forward to taking part in this year’s Woking Food & Drink Festival.